These days there are many options when it comes to transporting your baby. Whilst prams and pushchairs are ideal for long days out in town where you might have shopping bags to carry, these are not always practical options for navigating public transport or going on hikes in the great outdoors. That’s where baby carriers come in. Just like we have bluetooth for our mobile, now we have options for a hands free baby. So, whether you’re out and about and just don’t want to lug around the pram or you have tons of chores around the house to get done but the baby won’t settle without you, you might consider one of these baby carriers. Baby slings are a popular form of baby carrier and are designed to be a practical way of carrying your baby that leaves your hands free for other things. Made from a fabric, such as cotton, they are usually one piece of material that loops over your shoulder to form a sling in which your baby can lie in the comfortable cradle position. Flexibility is one of the key advantages with baby slings and many can also be used to carry your baby on your hip, your front or on your back. They’re great for breastfeeding, as they allow you to do it discreetly and they’re also good if you have back problems due to their flexibility. Most slings can be used from birth and many can be used all the way through to toddlerhood. Compared to slings, front carriers offer a more ‘structured’ design and often include extra features, such as safety harnesses and buckles. Front carriers can often only be used for the first few month’s of your baby’s life because as they get bigger, they get heavier and this can place a strain on your back, neck and shoulders. Many are also not suitable to be used by newborns. There are two types of front carrier – ones where the baby faces you and ones where the baby faces outwards. Generally, the latter are best avoided as the seating position that this puts your baby in can mean all their weight is resting on their crotch. Some models are even more flexible and can be converted into a back carrier too, which makes them a very useful type of carrier. 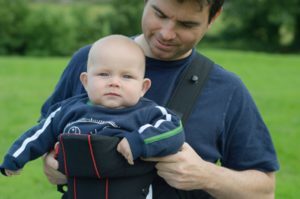 Back carriers are the bulkiest sort of carriers and they are only really suitable to be used by babies who are six months and older and who are able to sit up on their own. 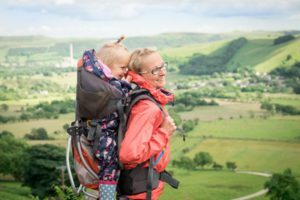 Back carriers are especially popular for those parents who like to get out and about in the great outdoors and many have extra storage compartments and pockets, as well as rain and sun covers. Generally, they are more comfortable to use over long distances than a sling or a front carrier because they are very similar to wearing a rucksack and you’re able to use them well into toddlerhood thanks to the fact you can carry more weight on your back. Because they are generally bigger with more features, they tend to be the most expensive type of baby carrier.